This larger aquarium at Biota housed a shoal of captive-bred Yellow Tangs. 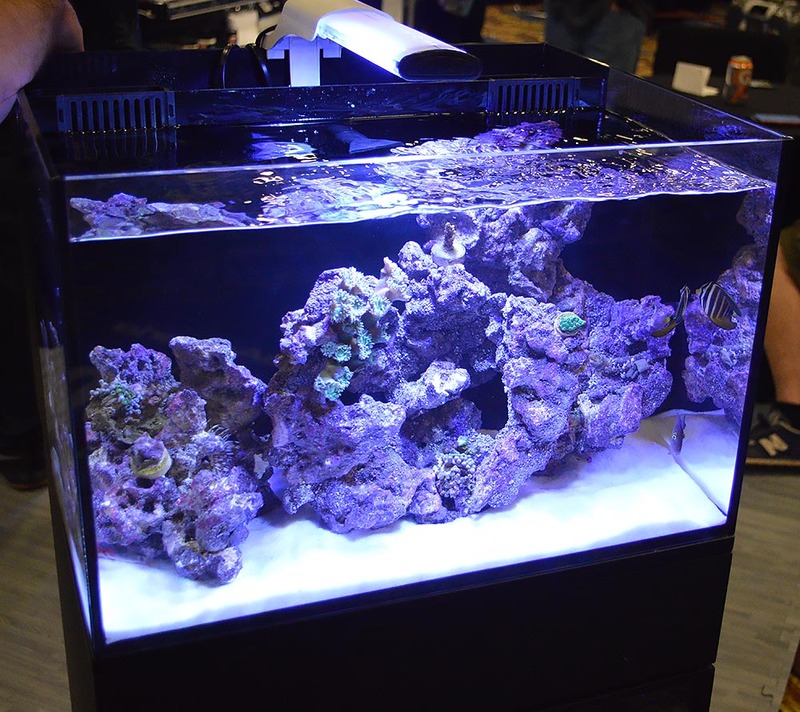 Going to an aquarium tradeshow can be quite the experience, particularly for the first-timers who’ve only been in the hobby a few years. 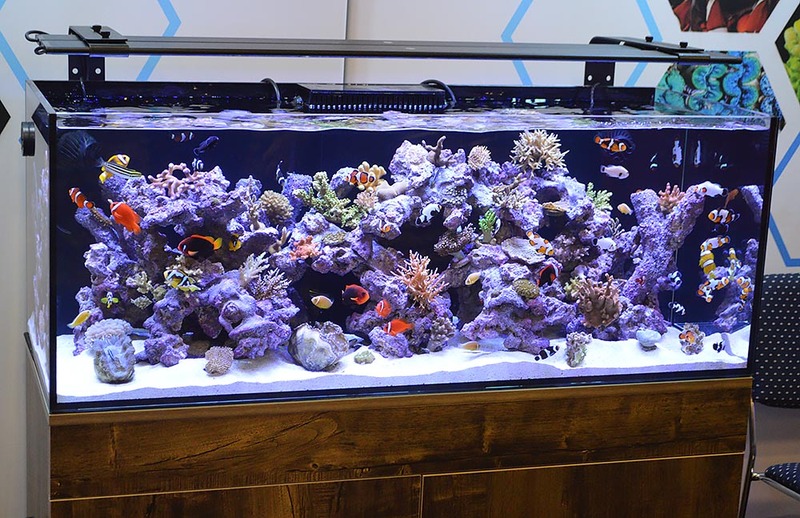 We all know that establishing a saltwater aquarium or reef tank takes a certain level of time and patience—you don’t throw an aquarium together overnight. Right? 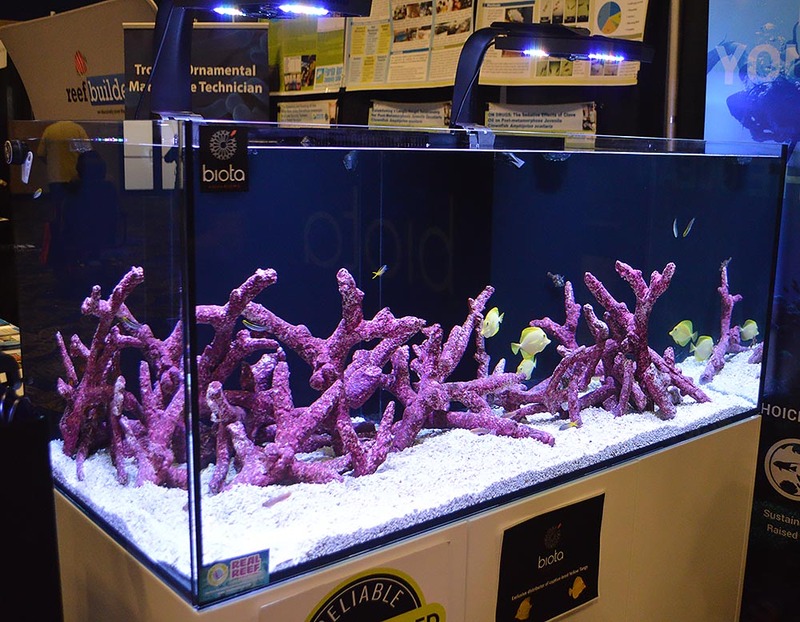 Viewing the aquariums on display at a tradeshow like MACNA might cause a bit of a conflict about the notion of patience when it comes to visually pleasing results, but there is a caveat. Many of these aquariums are set up truly “overnight” and are meant as very short-term displays to only last a few days before being dismantled. 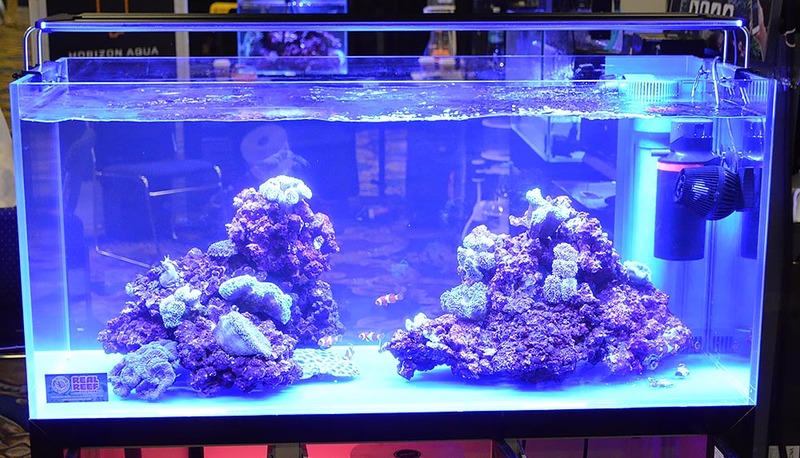 They upend the notion of patiently establishing a marine aquarium. But that’s not to say that they’re just thrown together. No, these aquariums are planned often well in advance. The filters in use may have been seeded and seasoned for weeks or months prior. 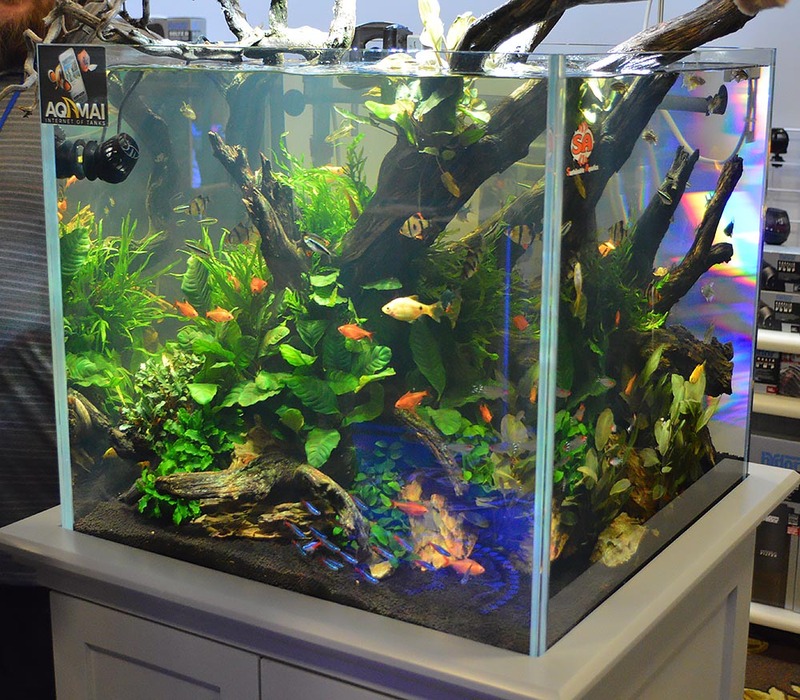 In some cases (I recall certain smaller freshwater aquascaping displays), the tanks were grown out for months prior, then drained and moved largely intact, only to be refilled on location. 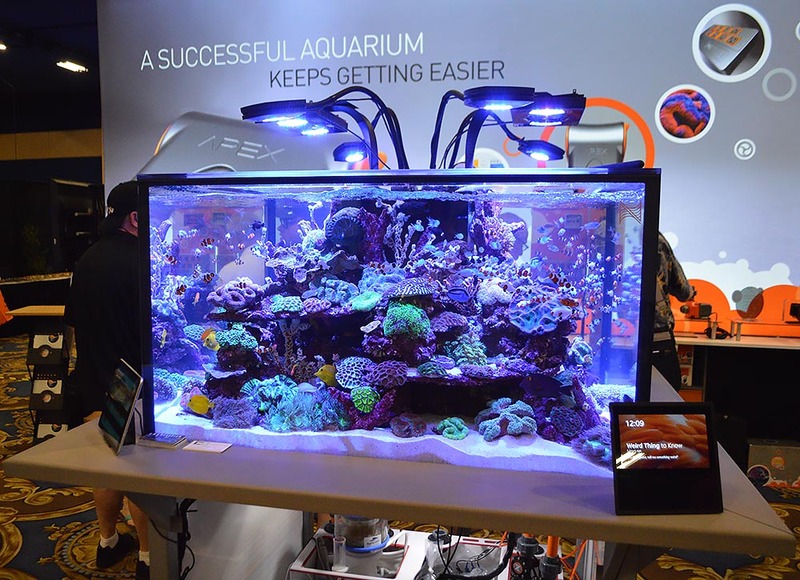 Often, these displays simply serve as a pit stop for the aquarium life on display, as often the fish and corals are already pre-sold to a final end user in the general metropolitan area. The tanks themselves are generally installed by veteran aquarium maintenance experts, and every trick of the trade is employed to ensure that water parameters remain healthy during the event. 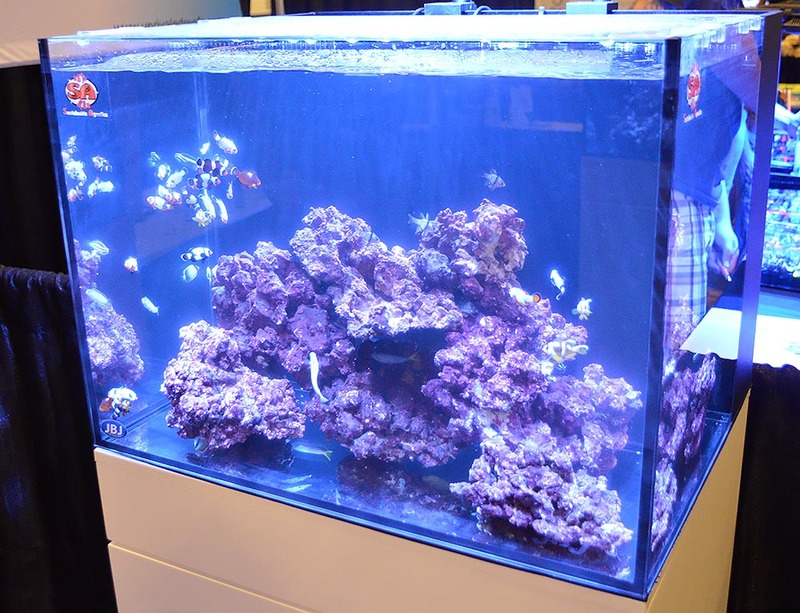 It also bears mentioning that there’s a lot of finances behind setting up aquariums this fully-stocked, on such short notice. 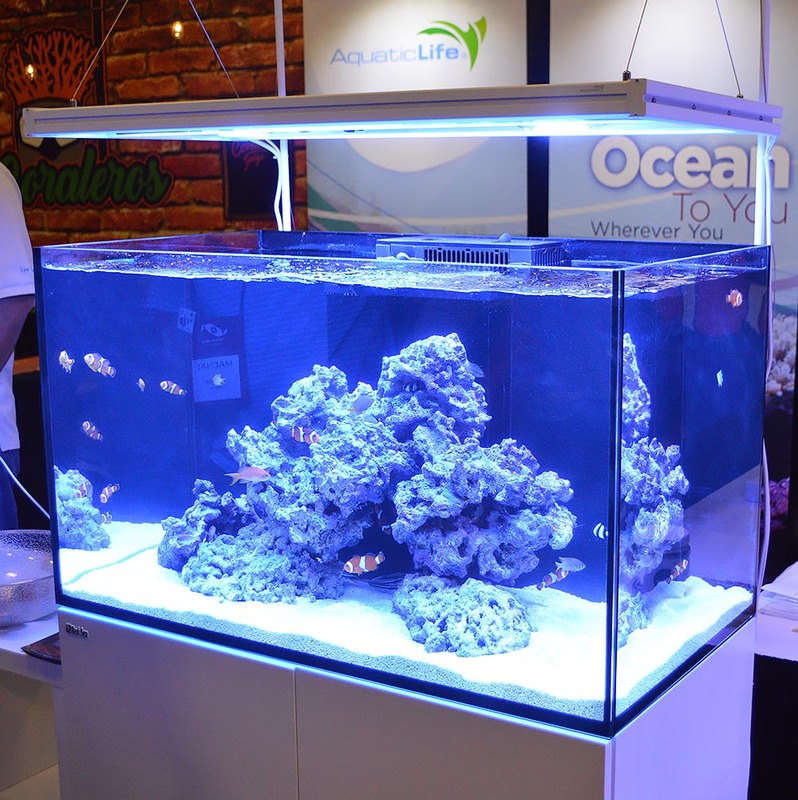 Ultimately, this is one of those times where the wise advice coming from the aquarium industry experts might be “do as we say, not as we do.” It takes substantial resources, planning, and experience to create these short-term marine and reef aquarium displays. That realization should certainly be considered in appreciating them. 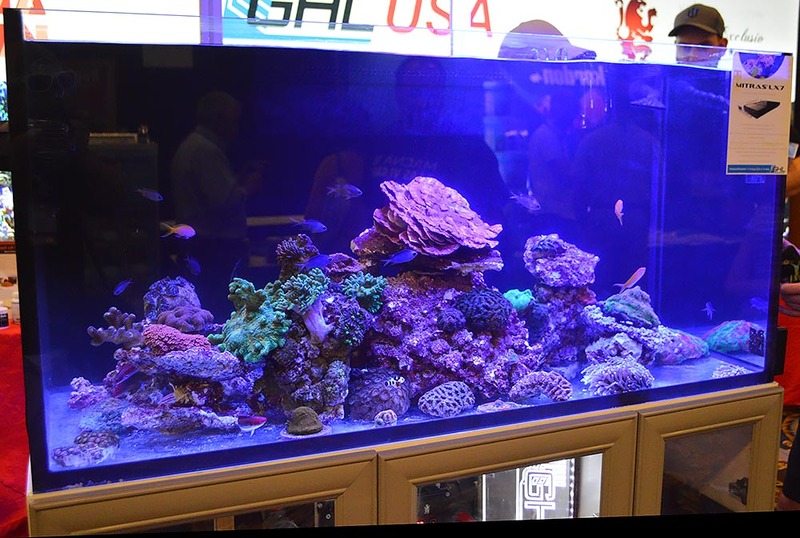 For now, enjoy this selection of the reef aquariums and saltwater fish tanks on display at MACNA 2018 in Las Vegas, NV. Not every display is included here, but any omissions are purely because we didn’t get the photos we’d need to show them here! 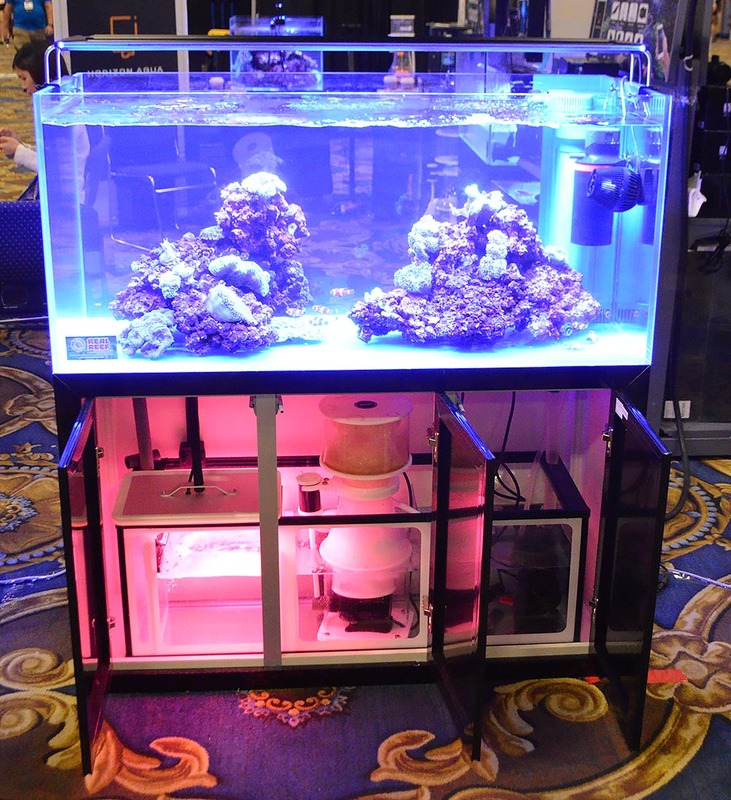 Hydor Group’s booth included this nice rimless tank setup. 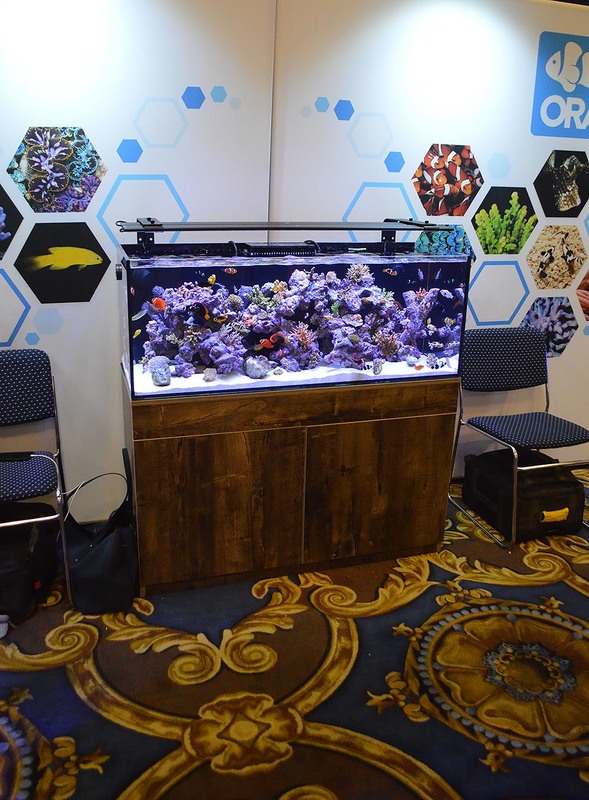 A closer look at the reef aquarium on display in the Hydor Group’s booth at MACNA 2018. 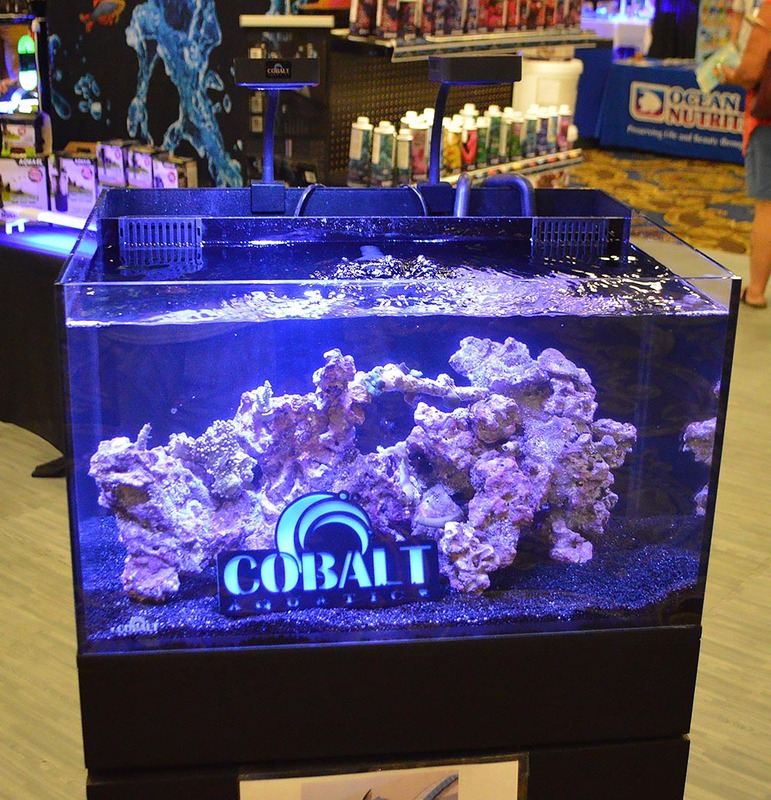 An all-in-one (AIO) fish tank on display by Cobalt. 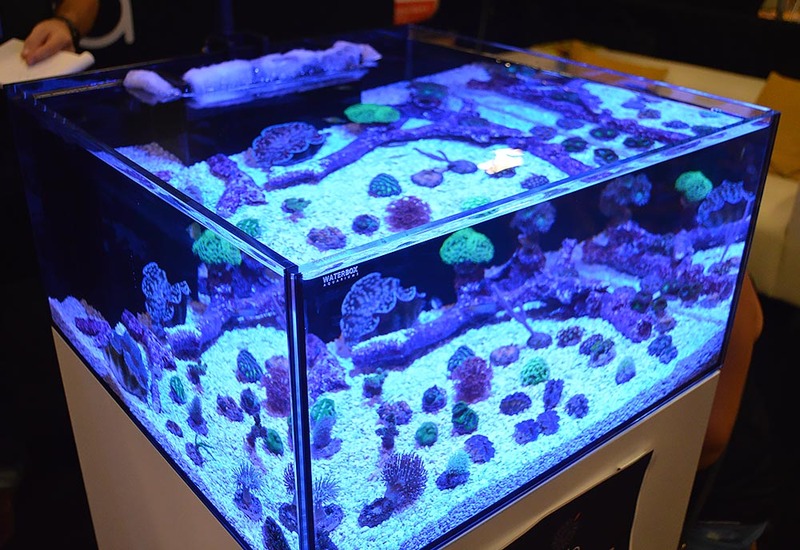 One more variation on the AIO aquarium by Cobalt Aquatics. 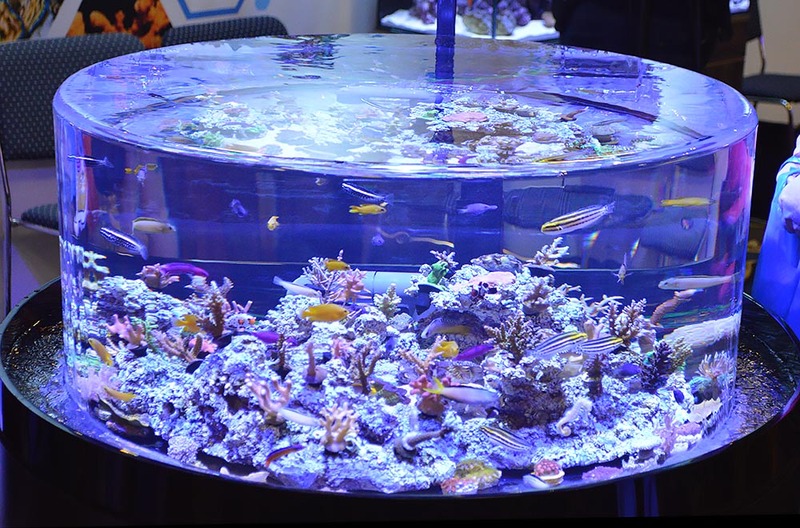 This Zero Edge is a perennial display by Oceans, Reefs and Aquariums (ORA). 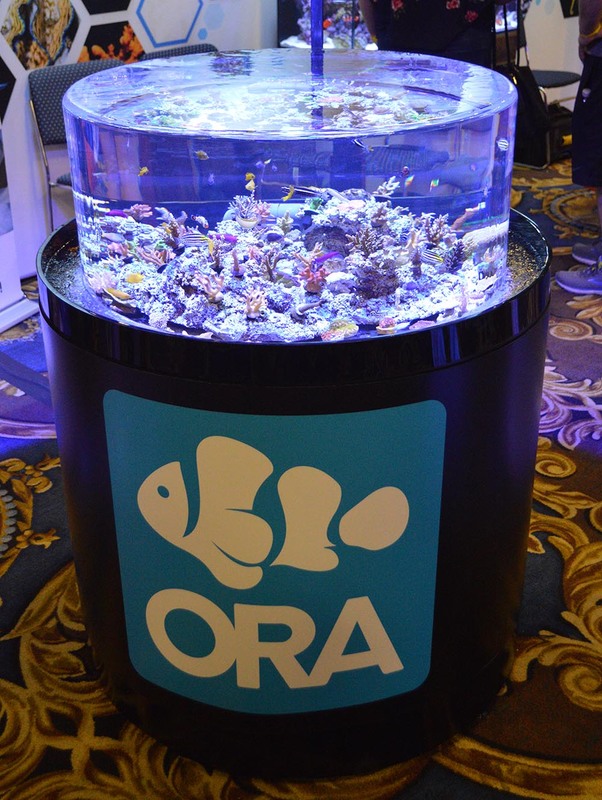 ORA’s round tank held a few surprises for those who were paying attention! ORA’s impressive display of cultured fish and coral would look fantastic in a home or office. 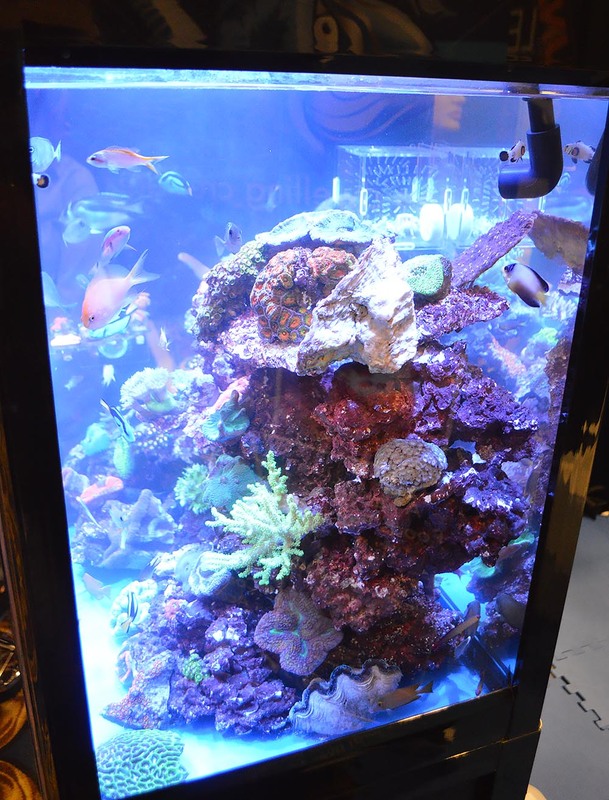 A closer look at this second aquarium full of corals and captive-bred fish by ORA. 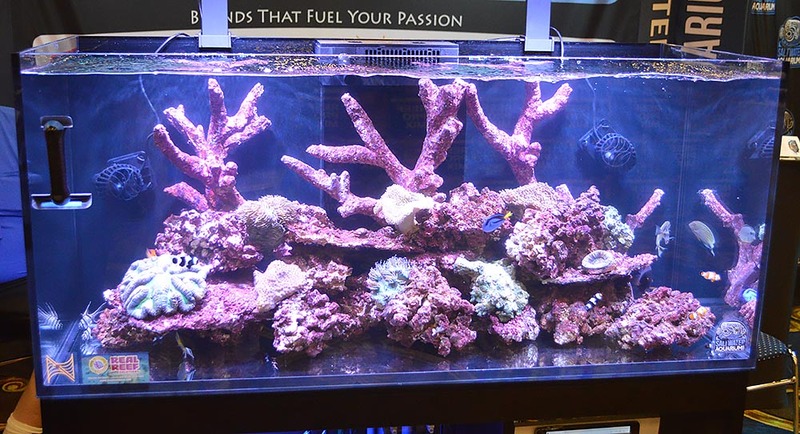 This display at SaltwaterAquarium.com highlighted Real Reef’s Branch Rock. A well-stocked display in front of the GHL / Fauna Marin booth. Biota Aquariums had four displays running, this one featuring aquacultured Clown Triggerfish (Balistoides conspicillum). Front and center at the Biota Aquariums display was this smaller aquarium, which held two surprises: Biota’s new hybrid Tridacna clams, and transparent larval captive-bred Yellow Tangs transitioning into yellow juveniles. 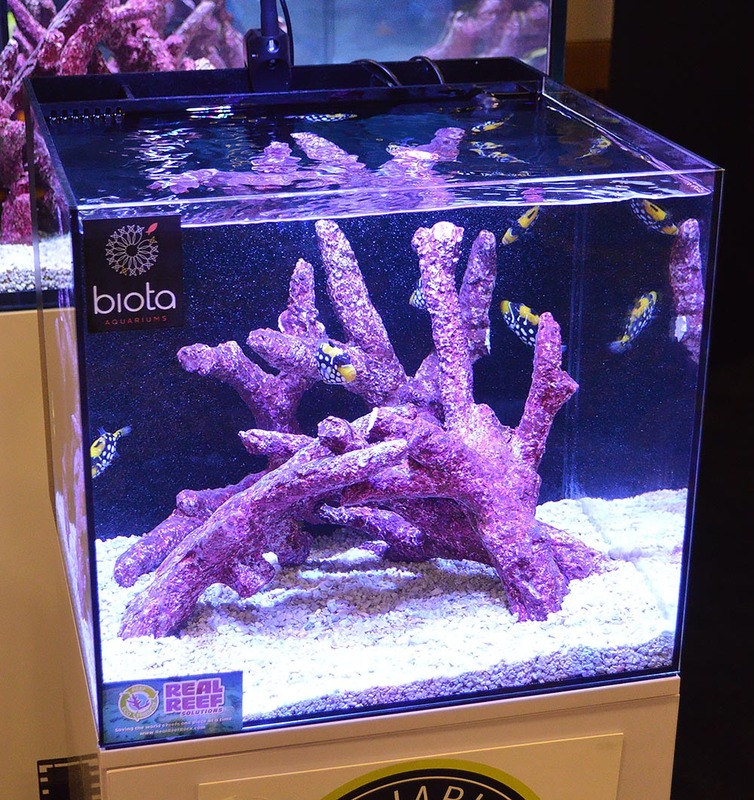 The typical all-in-one Biota Aquarium meant as an entry-level option for prospective marine aquarists. 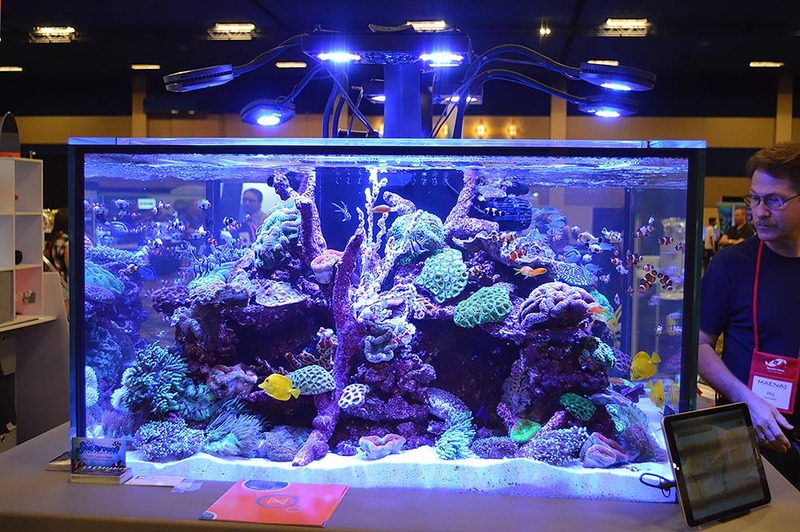 The main display from livestock wholesaler Sea Dwelling Creatures (SDC). 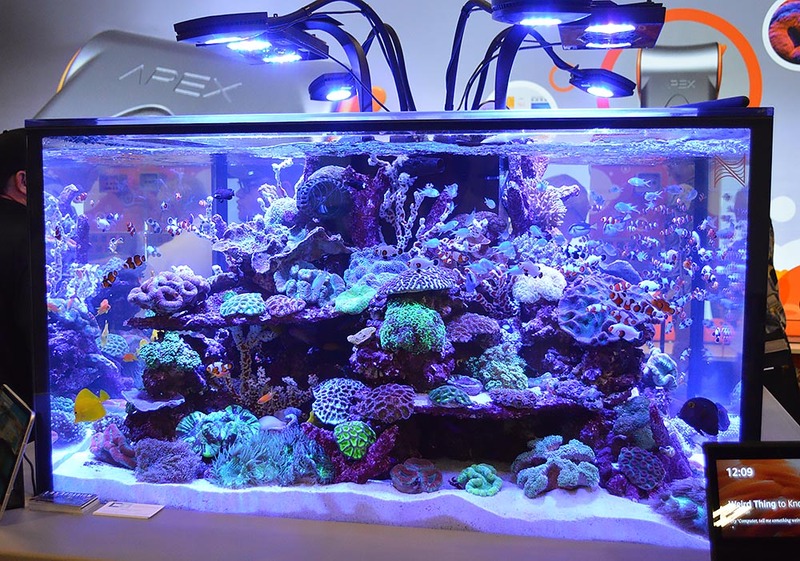 A look at SDC’s reef display from the side. 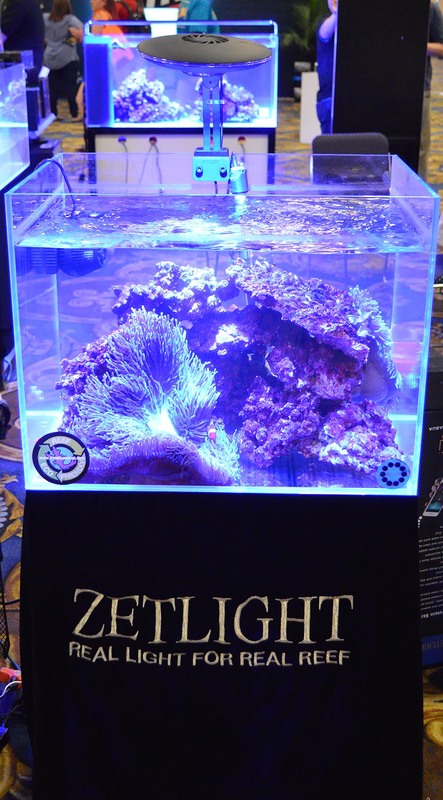 A mid-sized aquarium on display at the Ming Trading/Zetlight booth featured two bommies of Real Reef rock. There are more exciting revelations underneath this display by Ming Trading & Zetlight. 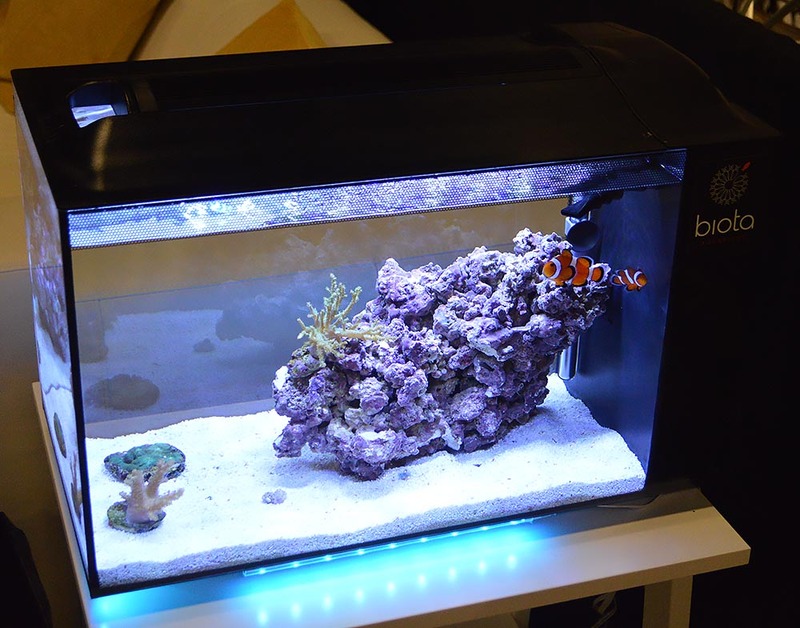 Simple and effective: a clownfish and anemone dominate this modestly-sized aquarium display by Zetlight & Ming Trading. People’s backs must be killing them after leaning over frag tanks all day at a MACNA. 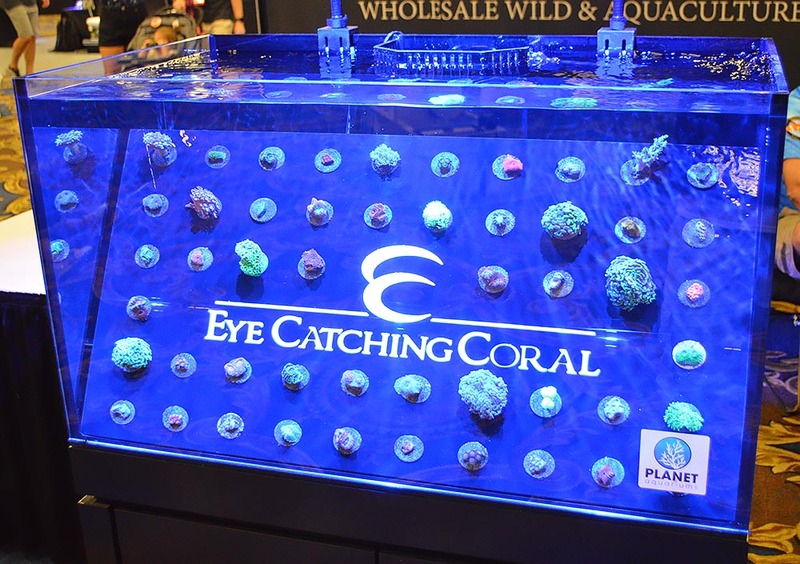 This thoughtful diagonal coral frag display at Eye Catching Corals is just what the chiropractor ordered. This display of captive-bred fish by Sustainable Aquatics held some of the first captive-bred Cream Angelfish (Apolemichthys xanthurus). 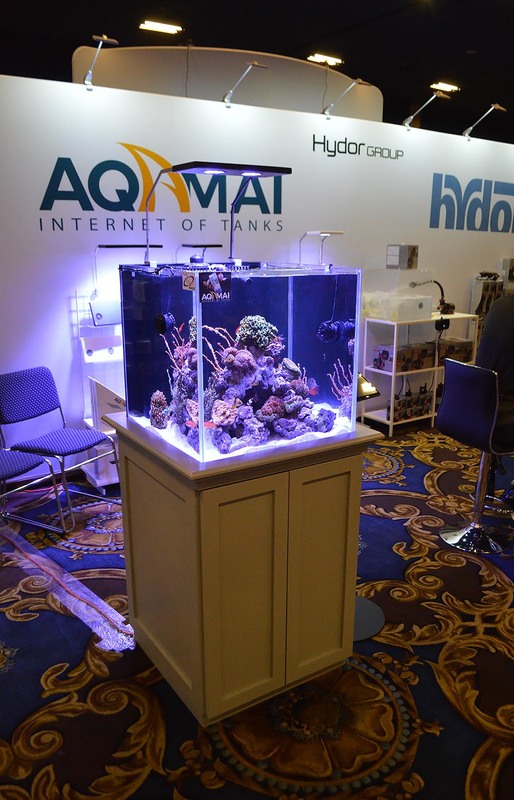 Also on display by Hydor Group: one of the only freshwater aquariums seen at MACNA 2018. Note that these two images were shot moments apart; an interesting side effect of the way some LED lights are controlled is that the spectrum of light captured by the camera may vary at any given moment. 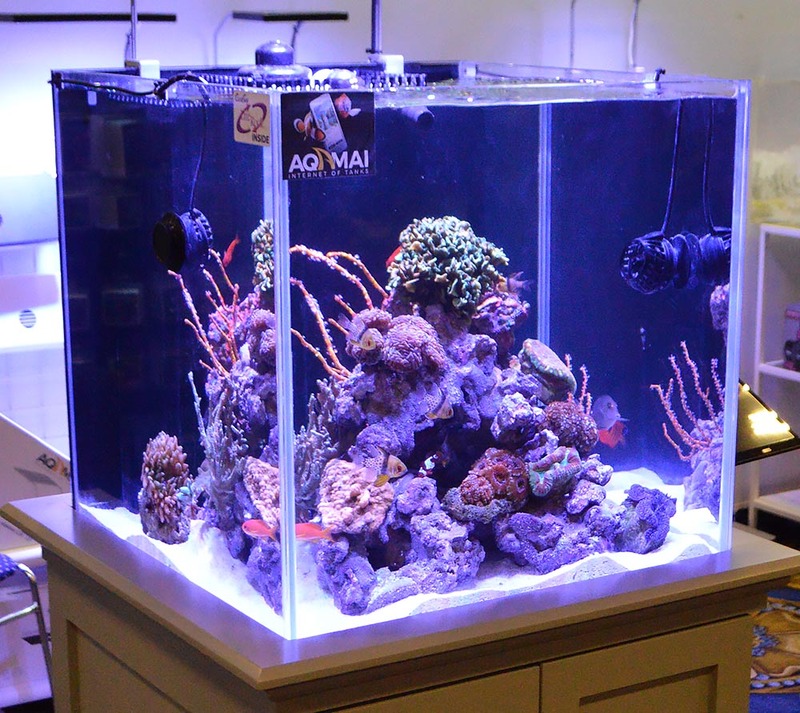 A clean setup was on display by AquaticLife. 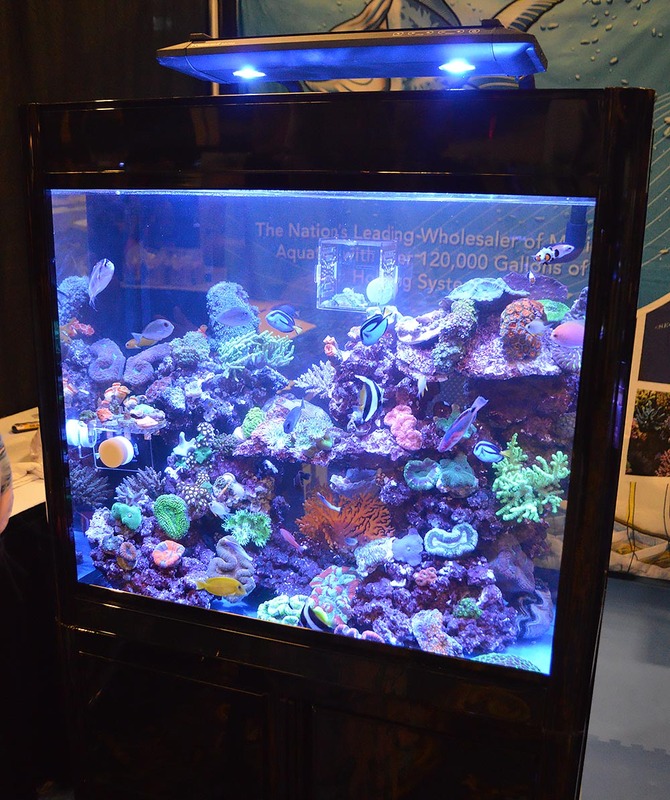 The talk of the show was this square footprint, 360-degree viewable display showcased by Neptune Systems. 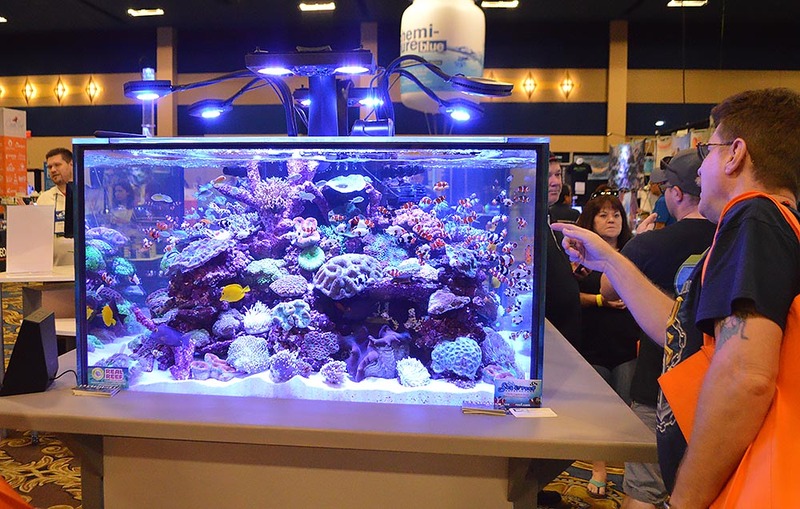 A view from the front: Neptune Systems’ large and impressive reef aquarium display. Another closer look at Neptune’s reef aquarium. Neptune’s reef aquarium was overflowing with colorful fish and corals, here viewed from a third vantage point. Very cool to see for those of us that didn’t make it. Jerry, glad to hear you enjoyed it! There were at least a handful of other aquariums I failed to capture that really should’ve been here too. Just ran out of time! Jerry, glad to hear you enjoyed it! There were at least a handful of other aquariums I failed to capture that really should've been here too. Just ran out of time! Thanks Matt, Very cool to see for those of us that didn't make it.